Welcome to the February Blog Hop brought to you by the same old gals with a new name -we are now officially the Creative Life Scrapbookers! We've got a new Facebook page for you and we'd love to have you join us there so we can share info and ideas and interact with you more regularly! This month we have a wide assortment of inspirational memory-keeping and papercrafting projects for you so make sure you've hopped through all of the blogs! You have probably arrived here at my blog from Julie Tambrini's Blog and at the end of my post I'll send you along to Karyn McDermaid-Rolfe's Blog to finish us up! Today I have a card/mini-album project to share with you! 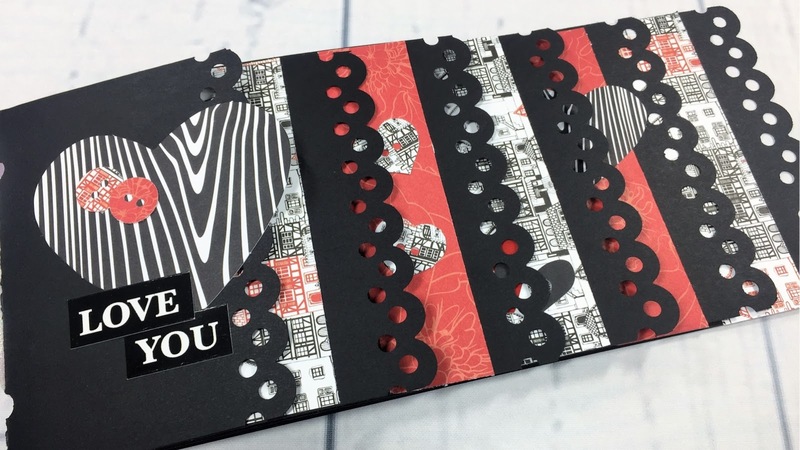 It's made from just one piece of 12 x 12 Black Cardstock, has cute edges courtesy of the new Scallop Dot Border Maker Cartridge and is decorated with papers and embellishments from the lovely Mi Amor collection! Punch along two opposite edges of your 12 x 12 cardstock using your choice of border maker cartridges. Turn paper so the punched ends are at the top and bottom, then cut lengthwise at 4", and again at 4" to create three, 4" x 12" strips. Using your Multi-Purpose Tool and the track of your 12" Straight Trimmer, score the first strip across the strip at 2.75", the second strip at 4" and the third strip at 5.25". Fold each piece along the scored line. Now place the folded strips inside each other - the strip folded at 2.75" will be the outside of the album, the strip folded at 4" will be next and the piece folded at 5.25" will be the middle of the album. You should have a layered, cascading effect on the front of the mini-album! Attach all pieces together using staples, or punch two holes at the fold and attach using Ribbon, Baker's Twine, Cording or Yarn - whatever you have on hand that coordinates with the papers you are using. I ended up using a shimmery gossamer style narrow ribbon tied simply in a bow. Decorate the mini-album and add photos as desired. I placed a 1" x 4" piece of paper on the edge of each page just under the punched trim of the page above it so the Scallop Dot punched pattern shows up a bit more and it provide a border on each page for your photos and journaling. I trimmed my photos down to fit each double page spread as follows: Spread 1, no photos. Spread 2, journaling and one 3" x 3.5" photo. Spread 3 (centre of book), two 4" x 3.5" photos. Spread 4, two 5" x 3.5" photos. Spread 5, two 5" x 3.5" photos, plus journaling. I didn't put any photos on the back, but you could definitely add one, another embellishment or some more journaling. I doodled a "frame" around each photo and wrote my journaling with the Silver Metallic Pen. Finally I added a variety of the Mi Amor die-cut embellishments and stickers to finish off the album. You can make so many variations on this mini-album by varying the punch, color of cardstock and papers & embellishments used. I'd love to hear what kind of mini you might be making - please feel free to leave a comment! Don't forget to head over and like our new Facebook Group - watch for monthly sketches, more Blog Hops and lots of ideas and inspiration! Thanks for joining us! Oh my gosh!! I absolutely ADORE that mini-album!! I have a crop on Saturday, maybe I'll offer it as a make & take!! This is such a great idea, and I love your videos!!! Super cute, Noreen! Thanks...can't wait to try it. Unbelievably inspiring as always-great idea!